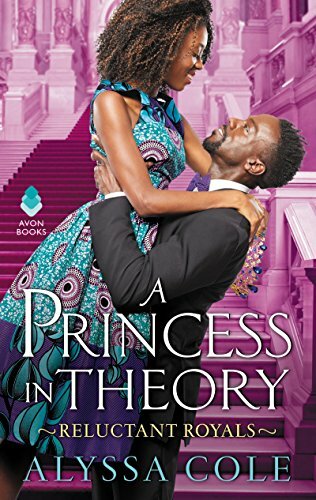 Win a print copy of A PRINCESS IN THEORY, the first book in Alyssa Cole’s Reluctant Royals series. Entering is as easy as leaving a comment. Winner will be listed here. Good luck! Congrats, Caroline! Please email me at contact at smittenbybooks dot com with your snail mail address to collect your book. Also, don’t forget to include the title in your email. You have 3 weeks claim your prize. This book. This book… I finished reading it almost a week ago and I’ve been thinking long and hard about how I will write this review. The things I want to say, the things I should say, how I would rank it. Where it fell on those lists. For starters, this book left me with a lot of questions— the good kind. Questions that make me want to pick up other books, research things on the internet, etc. I found myself curious with concepts of African cultures, traditional clothing, hair styles and I wanted to know more. A book should inspire the reader to seek out new experiences and Cole’s story did just that. Traditional book elements – setting, plot, characters. All of these are fabulous. The author hits perfection giving us Naledi, a STEM student who’s working hard for everything she has and wants. The book accurately portrayed, a bit minimalized in my opinion, the challenges of a woman in the scientific fields, from others putting more work on her plate to having to work twice as hard for any type of recognition. Naledi is that smart woman in all of us who’s constantly battling the patriarchy. I love her! The prince, Thabiso, is equally alluring. He’s the prince who has everything, but is still missing something. He works hard, plays hard and wants a chance to meet the woman he was betrothed to at birth. The betrothed part of this story, the weaving of emails that read like some Nigerian scam, the connections and family histories, including Naledi’s hardships as a child… the elements flow seamlessly and weave a fantastic Cinderella plot. Though, this Cinderella doesn’t have an evil stepmother, and she’s rescuing herself. I say Cinderella only because Naledi goes from living in a world where she has to fight for everything, even basic comforts, to the possibility of having it all provided for her. Secondary characters, Portia, Naledi’s best friend, and Likotsi add some extra flair to the story and I can’t wait to see if they both get their own tales. The villain is horrific, which for me is a big deal if you’ve read my past reviews. Thankfully, the baddie gets their just desserts. Now, when we get to a 4.5 star book, I tend to get nitpicky. I immediately ask myself what’s holding me back from going all the way. For this reader, it’s one thing: no epilogue. I really wanted to see Ledi and Thabiso back in New York. They didn’t have to be married, but to see him supporting her future, to see her making headway in her work. It would have been a little cherry on top. There is something else about the story that also held me back from the 5 star, but for the life of me, the entire time I wrote this, I couldn’t think of it again. So, it must have been very miniscule. Regardless, if you love contemporary romance, Sarah Morgan, Alisha Rai, or Tracey Livesay… you will love this story. Grab your copy post haste. I am eagerly awaiting the second book, which you can snag the first chapter of it in this one. Alyssa Cole would be a new author to me! Thank you for the opportunity! Please withdraw my name from this contest, as I met the author and purchased a copy of it yesterday! This book has been at the top of my wishlist ever since I heard about it. It sounds great.